Each time I open the kitchen cupboard, I get to look at art. Functional art. Hand and wrist saving art. 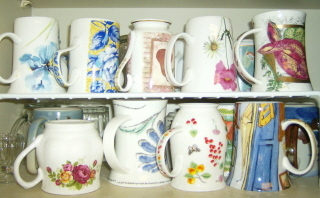 China mugs are lighter than stone-ware, which means less joint-strain. Good point. I’ve also been known to “dye” my blouse because I haven’t been able to get a good grasp on the mug.